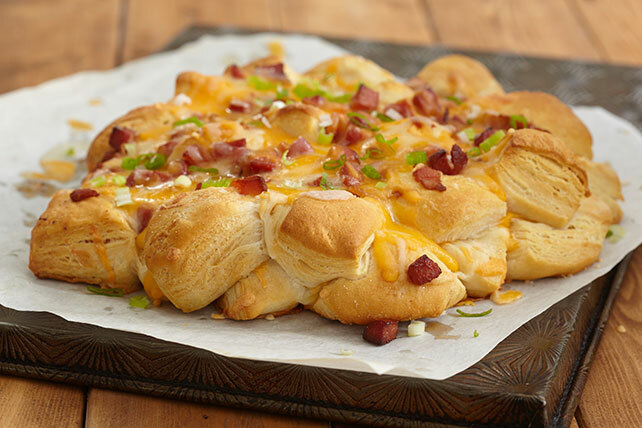 This hearty Cheesy Monkey Bread is made with sliced beef franks and crumbled cooked bacon. Bonus: It only takes 15 minutes to prepare for the oven. Hot dog! Combine franks and bacon. Separate biscuits; cut each into quarters. Arrange half the dough pieces in single layer in 10-inch round on parchment-covered baking sheet; top with layers of half each of the cheese and meat mixture. Cover with remaining dough pieces and meat mixture. Bake 25 to 30 min. or until golden brown. Top with remaining cheese; bake 3 min. or until melted. Sprinkle with onions. Prepare using KRAFT Shredded Mozzarella Cheese with a TOUCH OF PHILADELPHIA, and substituting 1 cup drained pico de gallo mixed with 1 tsp. chili powder for the franks and bacon. Prepare using KRAFT Shredded Mozzarella Cheese with a TOUCH OF PHILADELPHIA, and substituting 1 cup drained chopped tomatoes and 2 Tbsp. sliced fresh basil for the franks and bacon. Prepare using KRAFT Extra Sharp Cheddar Cheese.